WoodStone Desktops — Now available on a wide range of school desks and school chairs. WoodStone plastic offers a whole new level of convenience and value for you school furniture. WoodStone is a mixture of wood fibers and melamine resin, with a laminate finish, baked at 308°F under high pressure. It makes the perfect classroom furniture surface for school chairs and desks. Lighter — a WoodStone school desk weighs 7.5% less than a hard-plastic desk! More Affordable — WoodStone school desks cost about 16% less than conventional hard plastic — and that’s real good news for your school furniture budget! 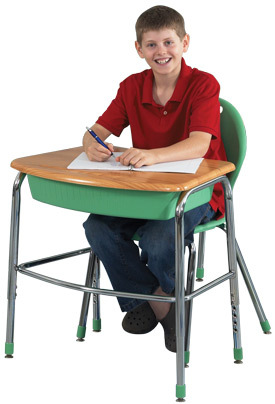 Reliable & Safe — WoodStone school furniture exceeds ANSI/BIFMA requirements on 5 rigorous tests! German Engineered — Used as classroom furniture in the most prestigious private schools in Europe.